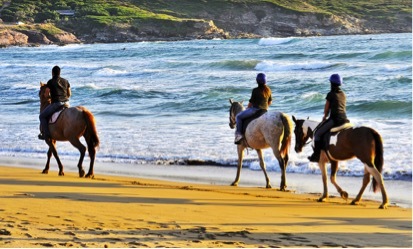 Piccoli Passi and the horse stables “Tre Stelle Sa Mandra” propose you a selection of horseback riding tours in the surroundings of Porto Ferro bay. Meeting point at Il Baretto on Porto Ferro beach and free transport to “Tre Stelle Sa Mandra”. A brief theoretical and practical lesson is planned for each attendant just before the excursion, in order to learn how to approach the horse and how to get on it in the right way. 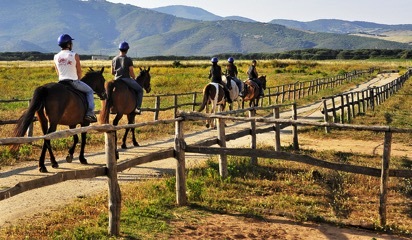 BEACH TRACK: Expert riders –Duration 2 hours – 50€ per person. At the end of the tour “Tre Stelle Sa Mandra” will offer you a final aperitif. STOP’N GO formula is available (camping at Surf Camp Porto Ferro in your own tents).